I took today off for the holidays and spent some time birding Lake Creek Trail this morning. I started at Parmer Village and only stayed out for about 45 minutes because of the cold wind. But I was able to find 30 species of birds in the drainage pond and around the Parmer Lane bridge. In the pond were 7 species of ducks and other water birds which is the most I've seen yet this season. There were Northern Shovelers, Green-winged Teal, Blue-winged Teal, 1 American Wigeon, Gadwalls, American Coots, and Pied-billed Grebes. 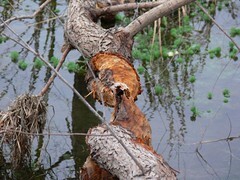 It is pretty amazing beavers in Austin? I doubt they have the best food to choose from compared to the native aspen they so thrive on in the Great Lakes states. Do you know what species of tree they chowed on? The beavers prefer willow trees. They will also chew on mountain juniper, but I don't know if they are eating them the way they do willows or if they are just marking their territory or sharpening their teeth. I don't know much about the habits of beavers. As Gracen said, those were small willow trees they chewed down. I was sad to see the felled trees but beavers do what they do I guess! Interesting! 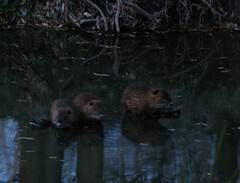 I wonder when the beavers are most active, and if there's much chance of seeing them when I'm out birding. Solitary Sandpiper is a great sighting here for the winter. Where did you see them? Do you think they'll try to dam up the creek? I can't imagine that would be a good thing. Hi Mike! I don't think they'll dam up the creek, only because it's already dammed in several places and (more importantly) there is too much human activity around there. 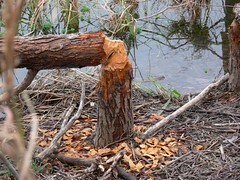 My guess (and it's only a guess) is that the beavers are just foraging in our area. Probably coming upstream from the ranch on the other side of Parmer Lane. Thanks Barry! I hope I get to check on that spot for the sandpipers on Monday or Tuesday. My boys are over the moon to learn that there are beavers in our neighborhood. I'm sure as soon as the sleet stops they'll want to go on critter patrol. Hi Casey! Cool, let us know if you find the beavers or any new evidence of them! Wow! I had no idea there were beavers in Austin. I always learn something new when I visit your site, Mikael. Very cool ducks, too. Happy New Year! Great photos- thanks! I have seen beavers at a pond in Cedar Park too. Thanks Dawn and Betty! I'm still surprised at what I can find in this suburban neighborhood.